In the previous article (http://ponnadi.blogspot.in/2013/06/anthimopaya-nishtai-6.html), we observed that the AchArya kainkaryam/anubhavam is greater than bhagavath kainkaryam/anubhavam through several incidents in the lives of our pUrvAchAryas. We will continue with the many incidents from our pUrvAchAryas in this article. Our jIyar (mAmunigaL) recollects the following incident quite often. 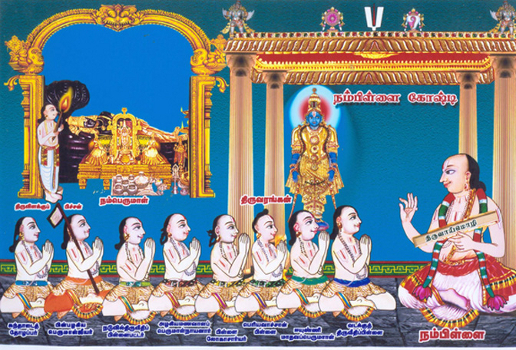 Once, nampiLLai along with his sishyas, visits thiruveLLarai to perform mangaLAsAsanam to the nAchiyAr there and is returning back to srIrangam. At that time, cauvery starts flooding. Wanting to cross the river, since there was no proper boat, they all boarded on a small raft to cross the river. The sun sets leading to darkness and it starts to rain as well - so it becomes difficult for the raft man to control the raft as it starts sinking. The raft man says "At this stage, if a few people jump off the raft, we can safely reach the destination. Otherwise, every one including nampiLLai will drown in the river". Due to fear of getting drowned, no one was willing to jump off the raft. Though, one lady (who is well situated in bhAgavatha nishtai) blesses the raft man for that suggestion and says "Oh raft man! Let you long live! Please ensure that nampiLLai, who is the life of whole world, safely reaches the banks" and jumps off the raft inspite of the darkness saying "nampiLLai thiruvadigaLE sharaNam". The raft momentarily reaches the srIrangam side safely. nampiLLai feels very upset with the unexpected demise of the lady. But, when the lady jumps off the raft, she ends up landing on a small island. Hearing nampiLLai's sad words she shouts from the island "swamy! Dont worry. I am still alive here". nampiLLai, considering she should be rescued, sends the raft man to bring her to the banks. She safely arrives and bows down at the lotus feet of nampiLLai. Since she is totally situated in AchArya nishtai, she asks "When I was drowning, did you take the form of the island and saved me?". piLLai responds "If thats your faith, let that be the case". A vaishNava king, once observed a big crowd of srIvaishNavas and asked "Are they coming out after worshipping namperumAL or after listening to nampiLLai's lecture?". Such was the glorious srIvaishNavasrI (divine wealth) of nampiLLai. Once, a lady who is a sishyai of nampiLLai acquired a house next to nampiLLai's thirumALigai (residence). Another srIvaishNava (a sishya and class-mate of this lady in nampiLLai's kAlakshEpa gOshti) who was living (renting?) in the same house. He suggests to the lady "nampiLLai's residence is a bit small. It would be nice if your offered your house to our AchAryan" many times. She keeps saying "Who will get such a nice house in srIrangam, I will keep this till the end of my life". This srIvaishNava goes and informs this to nampiLLai. nampiLLai tells her "All you need is a good place to stay? Please give your house to me so all the srIvaishNavas can comfortably stay there". She replies "OK, I will do that. But you have to give me a place in paramapadham". nampiLLai says "Given". She says "I am very tender-hearted lady. I cannot just trust your words. Please give me something in writing". nampiLLai being very pleased with the lady's Acharya nishtai, writes in a palm leaf that "On this year/month/day, thirukkalikanRi dhAsan gives a place in paramapadham to this lady. Let srIvaikuntanAthan fulfill this transaction by his mercy". She accepts that document, happily consumes thIrtham and prasAdham. She keeps worshipping nampiLLai for the next couple of days and on the third days ascends to parampadham. Thus, our jIyar says, that "Both nithya vibhUthi (paramapadham - spiritual world) and leelA vibhUthi (samsAram - material world) are at the disposal of AchAryan". kUrathAzhwAn's grand son naduvil thiruvIdhi piLLai bhattar did not appreciate nampiLLai's gyAnam, bhakthi, vairAgyam, abundance of sishyas and bhAgavathas in his gOshti, acceptance of everyone, etc. He was always behaving harshly with nampiLLai. Once he has going to the king's assembly and meets pinbhazhagiya perumAL jIyar on his way. He invites jIyar to join him to the sassembly and jIyar obliges. When they reach the king's palace, the king welcomes them and offers them respects and seats them in his big assembly. As he is an intelligent king with good knowledge in sAsthram and as he wanted to test the knowledge of bhattar, he asks bhattar "bhattar! srI rAman declares that he is just the son of dhasarathan and a human being (fully hiding his parathvam - supremacy), but how does give benedict jatAyu with mOksham?". While bhattar is contemplating the best answer for this, the king gets disturbed with some administrative tasks. bhattar asks jIyar "jIyar! How would thirukkalikanRi dhAsar explain perumAL (srI rAman) giving mOksham to jatAyu?" and jIyar replies "nampiLLai explains this principle per 'sathyEna lOkAn jayathi' (the truthful person can win all worlds)". bhattar then contemplates that and accepts that as the best explanation. The king returns and asks "bhattar! you still have not given the answer" and bhattar replies "You were looking at other things. Please pay close attention and I will explain it to you". The king obliges and bhattar explains the full rAmAyaNa slOkam which explains that truthful person will control all worlds and srI rAman being the epitome of truthfulness he was able benedict jatAyu with paramapadham. The king becomes ecstatic hearing the explanation and says "I accept that you know everything". He then gives great honours to bhattar and a lot of valuable clothes, jewels and wealth. The king bows down to bhattar and gives a grand farewell to him. bhattar accepts all the wealth and tells jIyar with great desire "jIyar! Please bring me to nampiLLai as I want to offer myself and all these wealth at the lotus feet of nampiLLai". jIyar brings bhattar to nampiLLai. nampiLLai, seeing naduvil thiruvIdhi piLLai who comes in the lineage of his paramAchArya (AchArya's AchArya parAsara bhattar) welcomes him happily. Seeing all the wealth submitted in front of him, he asks "What are these?" and bhattar responds "This is the reward for a few words of your thousands and thousands of divine words - so you have to accept me and these wealth and acknowledge me as your sishya". nampiLLai says "This is not correct. You being the grand son of AzhwAn (coming in such great lineage), cannot accept me as AchArya". bhattar bows down at nampiLLai's lotus feet, starts crying and responds "The king, who is a nithya samsAri, was able to offer so much wealth for your few divine words. If that is the case, how much wealth should I submit to you coming in the lineage of AzhwAn? Not only, I have been ignoring you for so long, even being next door to you but I was also feeling jealous about you. So, I can do nothing other than offering myself to you now to show my gratitude. So, please accept me". nampiLLai pulls bhattar up with great affection, embraces him and blesses him. He then starts teaching everything to bhattar and bhattar with great gratitude stays with nampiLLai all the time and lives blissfully. Then, nampiLLai explains thiruvAimozhi fully to bhattar in a detailed manner. bhattar listens to them carefully and documents everything and submits the palm leaves at the lotus feet of nampiLLai. nampiLLai asks "What is this?" and bhattar responds "This is the meanings of thiruvAimozhi as explained by you". nampiLLai opens the bundle and starts seeing that its huge in size of mahAbhAratham - 125000 granthams . He becomes very worried and asks bhattar "Why did you write this without my permission and in such great detail independently revealing the inner meanings of thiruvAimozhi?" and bhattar responds "Everything is documented as explained by you only, I have not even added my own punctuation - please see for yourself". nampiLLai says "You may have written whatever I have explained about thiruvAimozhi - but how can you write what I am thinking about? During udayavar's times, piLLAn tried very hard to get the blessings and permission of udayavar to write 6000 padi itself. But here, you have written 125000 padi without my permission and such detailed vyAkyAnam which will discourage sishyas from learning under the lotus feet of their AchAryas". He then pours water on the palm leaves and feeds them to termites and eventually they get destroyed. Subsequently, nampiLLai instructs periyavAchAn piLLai who is a dear sishya of him and who learnt everything from him, to write vyAkyAnam for thiruvAimozhi and he writes 24000 padi in the size of srIrAmAyaNam. After that, vadakku thiruvIdhi piLLai who is another close confidante of nampiLLai, once heard thiruvAimozhi kAlakshEpam from nampiLLai in the morning and documented the same in the night and submits that at the lotus feet of nampiLLai. nampiLLai asks "What is this?" and vadakku thiruvIdhi piLLai replies "this is thiruvAimozhi vyAkyAnam as heard from you this time". nampiLLai starts going through them and observes that its neither too detailed nor too brief and very beautifully documented in the size of srutha prakAsikai (vyAkyAnam for srI bhAshyam) - 36000 padi. With great joy, nampiLLai says "You have documented this very nicely; Yet since this was written without my permission, you hand it over to me" and keeps the same with him. He then hands over the vyAkyAnam to eeyuNNi mAdhava perumAL who is his dear sishya. This incident is explained by our jIyar in upadhEsa rathina mAlai 48th pAsuram. Further, all vyAkyAnams for thiruvAimozhi and their glories are clearly identified by mAmunigaL. Thus, nampiLLai appeared in this world and uplifted many jIvAthmAs for a long time and finally ascends to paramapadham. As part of the charama kainkaryam, all his sishyas shave their heads. naduvil thiruvIdhi piLLai bhattar's brother asks him "Is it not shameful for our kUra kulam (AzhwAn's family lineage) since you have shaved your head for thirukkalikanRi dhAsar's ascending to paramapadham?". bhattar responds "Oh! I have brought shame to your family now!". His brother asks "Why are being sarcastic?". bhattar replies "When nampiLLai ascends to paramapadham, since I have taken shelter at his lotus feet, since I am born in kUra kulam, considering AzhwAn's great quality of sEshathvam (total servitude towards his AchAryan), I should have shaved my face and body as servants do. But I have only done what sishyas do - shaving heads - that is indeed shameful for not fulfilling AzhwAn's nature of servitude". Then his brother asks bhattar "Now that your thirukkalikanRi dhAsar has left you, how long will you have gratitude towards him?" and bhattar replies "I will have gratitude towards nampiLLai forever - until this AthmA exists". His brother then realises the meaning of those words since he already was a great scholar and being born in an exhalted family. Our jIyar says "He then submits himself to bhattar and learns all the essential principles from bhattar". When some srIvaishNavas asked others "how would srI bhAshyam look like?" 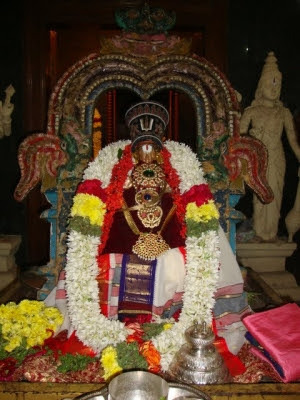 and they responded "In naduvil thiruvIdhi (middle street - one of the streets in srIrangam), there is one person named kUrathAzhwAn who wears beautiful vEshti (bottom cloth) and uththariyam (upper cloth). If you go to that street, you will see srI bhAshyam walking around". Some some srivaishNavas ask "Where can we hear bhagavath vishayam?" and they responded "There is a very sweet tree with most ripen fruits in naduvil thiruvIdhi named bhattar. If you go there, and stay under the tree instead of throwing stones, the ripen fruits of bhagavath vishayam will naturally fall on you". When parAsara bhattar was very young and was playing in the streets, a scholar named "sarvagyan" arrives on his palanquin with much pomp. bhattar stops him and asks him "Do you know everything?" and he says "Yes, I know everything". bhattar picks up handful of dust from the ground, shows that to him and asks "How much is this?". He was lost for words and just hangs his head down out of shame. bhattar then says "Give up all your titles and medals" and he obliges and admits his defeat. bhattar then says "You could have just said this is a 'handful' of dust and preserved your titles and medals! but you have now lost them all - so you can leave" and pushes him aside. bAshaNdi (mAyavAdha) scholars go to a (vaishNava) king and declares that there is no proof for shanka/chakra lAnchanam (marking of one's shoulder with heated conch/chakram which is done as part of pancha samskAram). The king being most intelligent, invites bhattar over and asks him "Is there proof for shanka/chakra lAnchanam)?" and bhattar says "Sure, there is". The king asks "Can you show it to me?" and bhattar shows his own beautiful shoulders and says "See here, I have them in both of my shoulders". The king accepts that with great joy and declares that "bhattar who is all-knowing has this shanka/chakra lAnchanam, that itself is sufficient proof" and drives away the bAshaNdis. The above incidents are explained by our elders. Thus sruthi vAkyams (relating to shanka/chakra lAnchanam) and the following two pAsurams/slOkams written by bhattar became very popular. Simple translation: Since I have the imprints of shankam (and chakram) of srIranganAthan who was worshipped by AzhwAn who appeared in kUram and explained the meanings of thirumanthram and dhvayam, it became a proof for the whole world to accept and follow. Simple translation: The fact that I have these shanka/chakra on my shoulders is itself a proof for srIvaishNavas to accept and follow that. From these incidents, we can understand that since all our pUrvAchAryas took shelter of their AchArya's grace, whether ignorant or scholarly, one has to depend on their AchArya for their upliftment.